In one week, there’s going to be an amazing collection of European cars here in San Diego, California. 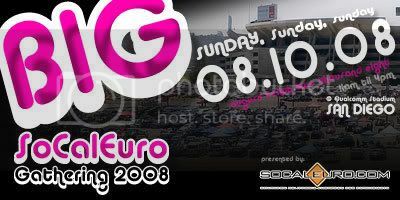 It’s the Big SoCalEuro Gathering 2008 located in the Qualcomm Stadium parking lot in Mission Valley. The show starts at 11am and runs until 4pm on Sunday, August 10, 2008. That’s right, Sunday, the day after the first San Diego Chargers preseason game against the Dallas Cowboys… I’m sorry, I just had to add that in, now that football season is near. I went last year and had fun. And I’m definitely going to try and make it this year. So, check it out! What is there to lose? It’s FREE!!! For more information, visit www.SoCalEuro.com. Here are some of my photos from last year. Click on any one of them and it will take you directly to the gallery. Or just go to Lapada Gallery.